Protesters from across Bergen and Passaic Counties are marching Saturday to raise awareness toward women's and civil rights they feel could be compromised under the presidency of Donald Trump. Dozens of Glen Rockers boarded three buses at the crack of dawn, each one headed toward Washington D.C. for the Women's March on Washington. 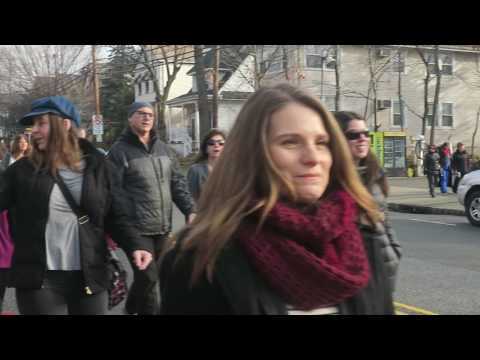 Others headed toward local rallies in Leonia , Pompton Plains, Wyckoff, New York City and more — many wearing pink, knit "Pussyhats" as part of a national movement supporting women's rights. Vocalist Alicia Keys, formerly of Englewood, performed "This Girl is on Fire" just before 2 p.m.
"We will not allow our compassionate souls to get stepped on," she said before singing. "We want the best for all Americans. We will continue to rise until our voices are heard... until our dollar is the same dollar as a man's and we continue to recognize that yes we can. Rutherford's Rebecca Weiss wore her "Pussyhat" on the streets of Washington D.C.
Hackensack High School graduate Genevieve Dietzel and Paramus' Asit Parikh went to New York City. CLICK HERE TO WATCH THE MARCH LIVE IN WASHINGTON D.C.